The Sydney Tower Eye is located on the corner of Pitt Street and Market Street, Sydney. The Sydney Tower Stair Challenge check is in Pitt Street Mall with the start line at 100 Market Street. Teams times are based on the first letter of your team name. Individual times are based on the first letter of your surname. Fancy Dress group times are based on the first letter of the Surname, of the first member alphabetically. Early Individual Runners (8-8:30am) Going solo! All report to check in by 8:30am. At start line by 8.40am. Fancy Dress (9:10-9:30am) Put on some 'special clothes' and go solo or with a group. All registrations are individual for this category. Late Individual Runners (10.40-11am) Going solo! Social/Walking Teams (11:10-11.20am) 4 persons per team, time taken is not important as it’s just about making it to the top! Individual Walkers (11.20-11.30am) Solo climb all the way to the top! No participants (any categories) to leave after 11:30am. The various categories allow everyone to complete the climb in the manner that suits them best. For those looking to post a fast time we recommend categories such as the Elite Climbers, Individual Runner/Climber or Running/Climbing Teams. Each person will be provided with a shoe tag that is activated when it passes over the timing mats at the start and finish lines. The fastest individuals and teams will be awarded prizes. For those simply wishing to make it to the top, the Social Walking Teams, Individual Walking or Fancy Dress Categories allow you to climb with no need to rush. You can take your time and be extremely proud of making it to the top of the town! For safety all walkers will be required to wear a timing tag simply so that we (event organisers) know exactly who has completed their climb and who is still making their way to the observation deck. For many participants they will run and walk their way to the top (doing a bit of both!). If this sounds like you, entering any of the running categories (Individual or Team), Buddies Climb or the Schools Challenge (for school students only) is the way to go. If you have any questions about your best category, please call Event Co-ordinator, Steve Corrie direct on 0439 975 759. The Check-in desk will be located only 50m from the start line on Pitt Street. Check-in will open at 7.30am for entrants in the Individual Runner/Climber category. All other participants should check in at least 15 minutes prior to their event. All event bibs and shoe tags will be distributed when participants check-in on the day. Shoe tags must be returned at the end of the event. Failure to do so will incur a shoe tag fee. The bibs are yours to keep! Individuals will be sent off one at a time with approximately a 20 second gap between participants. Running teams will line up together at the start line, with each individual member sent off at 20 second intervals. Walking teams can head off together as a group of 4 - we will then start the next team 1 minute later in order to keep the stairwell clear. All persons will start from the Pitt Street Mall starting line. For running teams, Buddies Climb and the Schools Challenge your individual times will be added together after the completion of the last persons arrival at the observation deck. The team with the lowest combined time is deemed the overall champion for that category. Please note that all participants in a team must complete the climb in order to be eligible for prizes in respective categories. For runners/climbers, a stair climb is a short duration, high intensity activity. Most participants can expect to complete the climb within 18-20 minutes. Please see the 'Training Page' for tips on preparing for the Sydney Tower Eye Stair Challenge. *It is very common to experience a cough in stair climbing events. Most people assume that it is due to poor air quality in the stairwell, or that there is excess dust, but that is not the case. It happens in any air environment, even outside events. Stair markers will be used to indicate your exact location within the stairwell at the Sydney Tower Stair Challenge. No Go Pro Style camaras to be worn during event. Filming of anykind in stair well is prohibited. Participants must be at least 10 years of age to participate in the Sydney Tower Stair Challenge, or 8+ years if participating in the Junior Buddies Climb**. 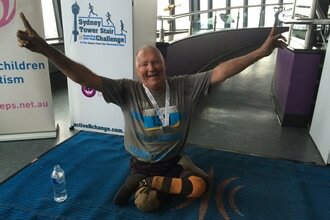 ​To check out the easiest way of getting to and from the Sydney Tower Stair Challenge by public transport, click here.